Cihuapilli Rose Amador Le Beau talks with Bridget Neconie. 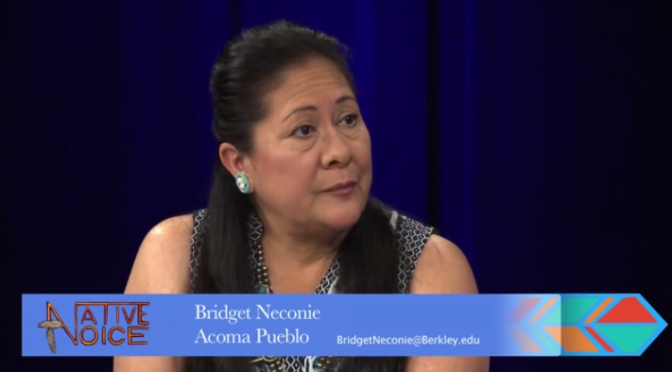 Bridget is from the Acoma Pueblo, Sky City, New Mexico. Her parents were in the military so the family has traveled to and lived in many far away places around the world. While living in Hawaii Bridget learned Hula and Polynesian dancing. She is learning traditional dance, plays hand drum and sings in a women’s hand drum group. She has danced professionally around the world, been a magicians assistant and is now working at U.C. Berkeley, recruiting Native Americans, in the Office of Undergraduate Admissions. Bridget has received awards for helping to promote higher education for Indigenous People. Bridget talks about concepts of continuing the pursuit of knowledge: intellectual, cultural, traditional, practical, theoretical and artistically. Taking our own knowledge and experiences to use in teaching others about Native Americans and making contributions to tribal society.